Discover The 'Truly Cornish Cafe Trail' And 'Choose Cornish' While On A Cottage Holiday In Cornwall! Love Food, Drink and coming on Holiday to Cornwall? Then why not indulge in some truly 'Cornish Cafe Culture' exploring some wonderful independant Cornish Cafes and Farm Shops, all of who pride themselves in sourcing local ingredients, supporting local suppliers, serving great Cornish food. Here is a selection from the 'Truly Cornish Cafe Trail' - to visit and enjoy whilst staying at Rooky's Nook - Luxury Holiday Cottage for 2, in North Cornwall. BLUE TOMATO in Rock, offering great food and drink, with friendly helpful staff, a laid-back atmosphere and truly mesmerising view overlooking the Camel Estuary, near the pedestrian ferry which crosses the river to Padstow. Great for a coffee and chin wag, especially after a walk with the dog along Daymer Beach. FRESH FROM THE SEA an artisan fish cafe in Port Isaac, offering some of the freshest fish sandwiches and salads, made using local crab and lobster landed daily in their own boat 'Mary D'. BOSCASTLE FARM SHOP AND CAFE North of Boscastle, set high on the clifftops, surrounded by National Trust farmland and less than 50 yards from the coastal path, offering great views whilst enjoying tasty home-made pies, pasties and cakes, - all made on site in their coastal kitchen. TREVATHAN FARM SHOP AND CAFE in St Endellion, this family run cafe is renowned for it's delicious traditional roast Sunday lunch with home produced beef and lamb, and great selection of fresh seasonal vegetables (plus 'PYO'- pick your own delicious strawberries). The Farm Shop is one of the best: packed full of local goodies, pickles, jams, honey, cheeses, fudge, free range eggs, clotted cream from their local dairy, country wines, Cornish beer and good old Scrumpy. Come and discover these Cornish cafe spots for yourself - and enjoy a perfect day out - and perfect Cornish holiday - (whilst also supporting local Cornish businesses and Cornwall's economy)! The TRULY CORNISH CAFE TRAIL is part of the Choose Cornish campaign, brought to you by Cornwall Food and Drink Chamber of Commerce, and includes 45 cafe spots throughout Cornwall. and explore this Truly Cornish Cafe Collection! 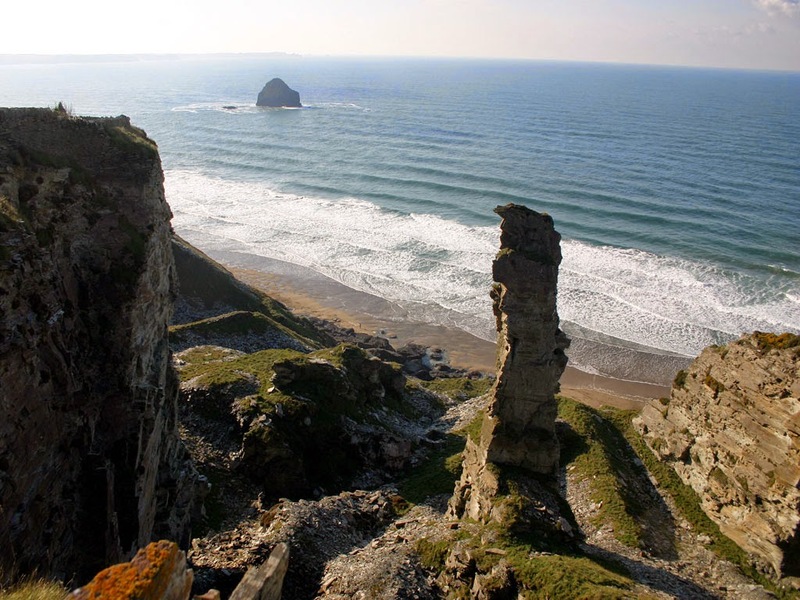 Essential to anyone's holiday in Cornwall, especially whilst staying in a luxury cottage in North Cornwall, (like Rooky's Nook), and wondering what to do, or where to go, should be a visit to Tintagel. Tintagel will offer you a truly memorable, and magical day out: from ancient castles and caves (associated with Camelot, King Arthur and the Knights of the Round Table) to the Old Post Office, pottery and pasties. (English Heritage) Tintagel Castle is steeped in legend and mystery, with a history stretching back to the Romans. Set on the rugged North Cornwall coast, these 13th Century remains include steep stone steps, stout walls, rugged windswept cliff edges, and dramatic views out to sea. And did you know 'Din Tagell' (Cornish for Tintagel) means 'Fortress of the Narrow Entrance' - named after this medieval fortification built on the peninsula of Tintagel Island, only joined to the mainland by a narrow neck of land? Merlin's Cave, located nearby, is where legend claims the magician Merlin, of the court of the mighty King Uther Pendragon, found the baby who was later to become King Arthur. At low tide you can walk through the cave - where smugglers used to hide! King Arthur's Great Hall - is an historic building on Fore Street, built in 1930's by philantropist (custard millionaire) Frederick Thomas Glasscock using 52 types of stone plus 72 stained windows, with an impressive large hall, granite round table and thrones - all to tell the story of King Arthur, and show the Coats of Arms and weapons of the Knights. (National Trust) Old Post Office is an original 14th Century Yeoman's farmhouse, with a famously wavy slate roofline, supported by hugh buttress at rear of the building, plus a beautiful small cottage garden. It's life as a Post Office only began in the 19th Century, with the introduction of Penny Postage, and improved postal services in remote country places like Tintagel! And to complete your day, why not finish off with a freshly baked Cornish Pasty or Cream Tea from Pengenna Pasties - simply delicious! Essential to all Holidays in Cornwall, when staying in luxury cottages near the coast, is the ability to enjoy visiting local Cornish beaches - whether to walk, swim, surf - or simply relax and unwind, taking in the sea air, sound of the waves - and awesome views! Staying at Rooky's Nook - luxury holiday cottage for 2, located between Tintagel and Port Isaac near the coast in North Cornwall will allow you to do exactly this! H. The coastline in Cornwall is about 300 miles. O. Cornwall has between 200 - 400 beaches, all accessible by foot. L. On the North Coast, between Padstow and Bude, there are 76 beaches. D. Cornish beaches are tidal, where high tides often cover all the beach, - so always check tide times before setting out. A. Bathing, swimming, surfing etc should only be undertaken with care, and where possible where there are lifeguards on duty, within designated areas. Y. Some Cornish beaches operate a 'dog ban' either all year, or between Easter and 1st October - so always check before setting out if you have your dog with you - to avoid any embarassment. C. You can find Merlin's cave (from the Arthurian legnds) at TINTAGEL HAVEN, a small sandy beach below the remains of Tintagel Castle. O.You can listen to the 'Blow Hole' at BOSCASTLE - where a hole in the cliff traps air as the waves crash through them, making the sound of a whale's blow hole. It is also the name of the local village magazine! R. The 'Doom Bar' sandbar in the River Camel Estuary, off DAYMER BAY is so named as it caused many mariners problems getting in and out of Padstow harbour, with Cornish folklore legend saying a mermaid created this bar as a dying curse on the harbour after she was shot by a local man. 'Doom Bar' is also the name given to the flagship Cornish Ale from Sharp's Brewery, brewed nearby in Rock, Cornwall. N. PORT QUIN was known as 'the village that died', after the Great Storm of 1698 when the entire village's fishing fleet tragically perished at sea. W. TREBARWITH STRAND (nearest beach to Rooky's Nook) was known locally as 'The Strand', with a small harbour originally used to export slate, from the Delabole Quarry nearby. A. PORT ISAAC (of recent Doc Martin TV series fame!) is still an active, working fishing harbour - (with small sandy beach) with medieval origins, having originally imported timber and coal, and exported wheat and slate. L. PORT GAVERNE is thought to mean ' Rocky Haven' with remains of the Cornish Pilchard industry in the old Pilchard cellars above the beach. L. WIDEMOUTH is unlike many beaches on the North Cornwall coast, as it not backed by high cliffs, but open sand dunes - and is a great surfing beach. - ideally located to explore all these Cornish beaches! Dog Bed: Like us, dog's like their 'canine comforts', and to have something familiar (which often smells of them!) will help them to feel secure, and happy, enabling them to relax in otherwise often unfamiliar surroundings - so please don't forget to pack their bed, throws, blankets or whatever they usually sleep in at home. If you have a dog crate/cage, this can also help provide a safe, secure place for your dog - helping to discourage them from climbing onto furniture and beds in your holiday accommodation, seeking a warm, comfy place in which to cuddle, or snuggle up! Holiday Dog Collar and Leads: Salty sea water and sand can discolour and erode both leather and metal on dog leads and dog collars. So to avoid this why not have special 'holiday leads & collar' for your dog, made from durable synthetic material. After all, we all have our own 'holiday gear' - so why shouldn't your 'pampered pooch' have theirs? Dog Food, Bowls and Water Bottle: Dogs, like their owners, are 'creatures of habit' and know what they like to eat and drink - including occasional 'treats' and rewards - especially if these are for good behaviour. So again, please don't forget to pack these (even if you can 'top up' at the local shops). Alternatively it may be easier for you to include your dog's petfood in your supermarket delivery on arrival. Poopa Scoopa Bags: All responsible dog owners know they should clear up after their dog, so please remember to pack lots of disposable poo bags for your holiday. And then also remember to use them! Wet Weather Gear: Wellies (or a pair of waterproof walking shoes), waterproofs, plus dog towels are basic essentials. Here at Rooky's Nook there is an outside tap where both muddy boots and muddy / sandy dogs can be washed off before going inside the cottage. Hot Weather Gear: Please remember to provide shade and water for your dog, and never leave your dog in your car in the heat, even with the windows open, as 'hot dogs can die in cars' - which would be tragic, and is totally avoidable. Local Vet(s): Every dog owner's worst nightmare is to have their dog hurt or unwell whilst away on holiday, so please make sure you know where the local vet is - and how to contact them - should the need arise. (At Rooky's Nook, we have 2 local vets nearby in Camelford). Plus, if you have Dog Insurance, remember to have these details with you - should you need to make a claim whilst you're away on holiday. Dog Friendly Beaches: Cornwall has an amazing selection of beaches - open all year, in all weathers, offering fantastic places to walk your dog. However some of these Cornish beaches operate a dog ban, either all year, or just 'out of season' (7am - 7pm daily, from Easter day until 1st October), so please remember to check before you wonder out - to save yourself and your dog any embarassment. Dog Friendly Walks: Here in Cornwall there are numerous fantastic dog friendly walks to explore, full of potential hazards so please take care, both of yourself and your dog. Whilst the views from clifftops are dramatic, (each year dogs die accidently running over cliffs), and the sea look very inviting (strong currents and swell can sweep you away from the beach out to sea), or mine shafts pose exciting places to explore (avoid falling in), so please watch out for both youself and your dog - and enjoy your holiday! Luxury Self-Catering Holidays In Cornwall - Local Cornish Cheeses To Taste and Enjoy! How many Cornish Cheeses can you name? How many Cornish Cheeses have you Tasted? Are you starting to plan what to eat when you're next away on holiday? And looking for some local speciality that's easy and tasty? But not wanting to spend hours cooking? Nor wanting to go out to eat? Then why not try some of these delicious Cornish Cheeses, all of which will add a true 'Taste Of Cornwall' to any meal or snack, whether you're staying in a cottage on a self-catering holiday in Cornwall, or at home - particulary as most of these Cornish cheeses are also available online, or a local farmshop or supermarket. DAVIDSTOW CHEDDAR - probably one of the best known, available in most supermarkets. Did you know that some of the milk used to make this award winning Davidstow Cheddar comes from Bodulgate Farm here in Trewalder, just down the lane from Rooky's Nook? Built on what was once a wartime aerodrome, the Davidstow creamery at Davidstow near Camelford, has been making this award-winning cheddar with its distinctive creamy character (possibly influenced by the ancient St David's Well nearby) for 60 years. - And it's...'Made with a Cornish point of view'! Did you also know that Cornish Yarg was named after a farmer on Bodmin Moor whose name was Alan Gray, which is Yarg spelt backwards? Plus, did you also know that Cornish Yarg is wrapped in Stinging Nettles - as the leaves attract naturally occurring moulds, which give an edible nettle rind that imparts a delicate, mushroomy taste to the cheese once matured? 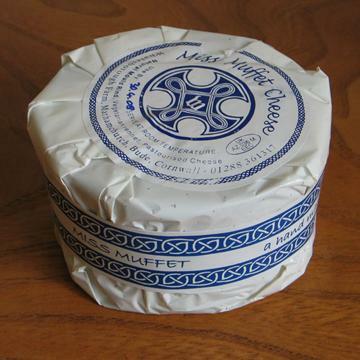 Plus it can also be made using Wild Garlic, known as Wild Garlic Yarg, where the Wild Garlic leaves give a gentle garlicky flavour, and their moisture gives the cheese a slightly firm texture. Are these 2 Cornish Cheeses similar to the best Dutch Edams and Goudas? These delicious handmade cheeses from Sue Proudfoot, the lady behind Whalesborough Farm and its beautiful Cornish cheeses, who learnt cheese-making from a family friend, and then set up her fledgling creamery in a converted corner of a grain store. Miss Muffet and Keltic Gold (a washed rind version of Miss Muffet bathed in local Countryman’s Cider to create a true connoisseur's cheese) are both sweet flavoured cheeses with a supple texture, definitely 'semi-soft' with "a springiness and cleanness on the palate, like the best Dutch Edams and Goudas". Remember it's never too late to book your next holiday at Rooky's Nook, luxury holiday Cottage for two, in Cornwall, and come and taste these local Cornish Cheese specialities for yourself!